Ginger for Migraine Headaches | Eat This! The typical symptoms of a migraine headache include pounding pain in the head, sensitivity to light, numbness, fatigue, nausea, and dizziness. Studies have found that ginger may help the symptoms. There are many ways to use ginger for migraine headaches. A study done by the “Gale Encyclopedia of Alternative Medicine” found that the antibacterial and anti-inflammatory properties in ginger can be helpful in reducing certain kinds of pain. Ginger contains volatile oils, protease, and lipids which may reduce or prevent migraines. In Denmark, a research study was completed by the Institute of Biology at Odense University, and they discovered that ginger might be an effective way to treat migraines. Ginger is not a total cure, but it can treat the symptoms as they are occurring. The reason that ginger may be an effective treatment for migraines is because ginger can help to reduce nausea and vomiting. Often, migraines are accompanied by nausea, and using ginger may help to speed up the recovery process by reducing nausea and vomiting. If you have regular migraines, you may consider trying ginger to see if it helps to reduce your symptoms. 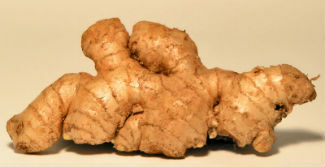 Ginger can be consumed fresh or in supplement form as a capsule, tincture or oil.